The San Antonio Radio Club (SARC) is one of the oldest amateur radio clubs that is still around and operating. It was founded in 1919 as the Bexar County Radio Association and reorganized in 1929 as the San Antonio Radio Club. We are one of the oldest affiliated amateur radio clubs of the American Radio Relay League (ARRL) having become affiliated with them in January 1919. 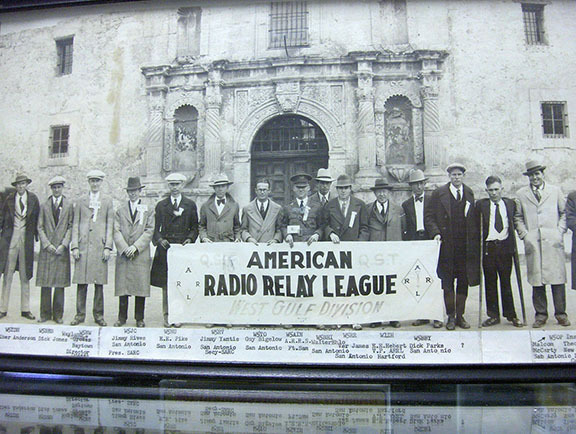 In 1995, the ARRL Recognized the San Antonio Radio Club – Charter of Affiliation for over 75 years. SARC is a non-profit corporation of the State of Texas. It has members who are active in various areas of the amateur radio service. Amateur radio operators are often called ham radio operators. SARC has committees for Radio Fiesta, Field Day, Jamboree On The Air (JOTA), Education and Training, Emergency Communications, and Volunteer Examiners. Radio Fiesta is a convention for hams. Such conventions are often called hamfests. Because SARC is in San Antonio where almost everything is a Fiesta, the hamfest sponsored on the 2nd Saturday every January by SARC is called a Radio Fiesta. Radio Fiesta includes dealers, a flea market, a tailgating market, a technical and informational program of presentations, DX Card Checking, and amateur radio licensing. Field Day is a nationwide ARRL sponsored event on the fourth weekend of June where SARC sets up under a tent in a field environment with emergency generators and temporarily erected antennas. Contacts are then made and logged. The real objective is to give members experience in operating in an austere environment like those that may be faced in emergency situations and to bring ham radio to the general public. SARC has operated from the field adjoining the City of Shavano Park who have been great hosts and friends of amateur radio. Jamboree On The Air (JOTA) is a nationwide ARRL sponsored event on the third Saturday of October. This event is for Boy Scouts, Cub Scouts, Girl Scouts, and Brownies. It is intended to introduce them to ham radio and, under supervision of licensed hams, get them On The Air. SARC held JOTA at the Texas Transportation Museum (TTM) in San Antonio, Texas, last year. It was a successful event and TTM were just fabulous hosts. Education and Training focuses on classes for unlicensed people to get their first license, Technician, or for licensed hams to upgrade to General or Amateur licenses. All classes meet on consecutive Saturdays for 8 hours. The Technician and General Classes meet for three (3) consecutive Saturdays while the Amateur Extra Classes meet for four (4) consecutive Saturdays. All classes end on the last Saturday with an official amateur radio licensing test session conducted by the Volunteer Examiners Committee of SARC. Information on upcoming classes is included in the Bexar Wire newsletter as demand is identified and classes are scheduled. Emergency Communications functions as SARC’s liaison to ARRL’s Amateur Radio Emergency Service (ARES) in Bexar County. Members interested in emergency communications are directed to ARES by this committee. Volunteer Examiners conduct official amateur radio licensing test sessions as a part of ARRL’s Volunteer Examiner Coordinator operation. Tests open to all members of the public are held on the fourth Saturday of the even numbered months at the Great Northwest Library in San Antonio, Texas. In addition, tests are open to all members of the public and are also conducted during Radio Fiesta.